For reduce() functions, they should be both transparent and standalone. For example, the _sum function did not rely on global variables or parsing of existing data, and didn’t need to call itself, hence it is also transparent. In order to handle incremental map/reduce functionality (i.e. updating an existing view), each function must also be able to handle and consume the functions own output. This is because in an incremental situation, the function must be handle both the new records, and previously computed reductions. The following diagram shows previous reductions included within the array of information that are re-supplied to the reduce function as an element of the array of values supplied to the reduce function. That is, the input of a reduce function can be not only the raw data from the map phase, but also the output of a previous reduce phase. This is called rereduce, and can be identified by the third argument to the reduce(). When the rereduce argument is true, both the key and values arguments are arrays, with the corresponding element in each containing the relevant key and value. I.e., key is the key related to the value of value. Fortunately, the simplicity of the structure for sum means that the function both expects an array of numbers, and returns a number, so these can easily be recombined. 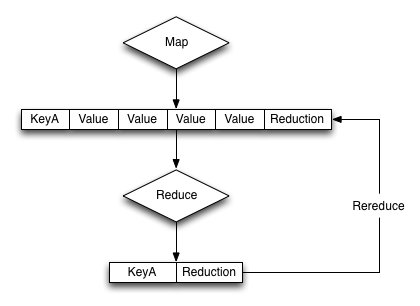 Each element of the array supplied to the function is checked using the built-in typeof function to identify whether the element was an object (as output by a previous reduce), or a number (from the map phase), and then updates the return value accordingly. Reduce functions must be written to cope with this scenario in order to cope with the incremental nature of the view and index building. If this is not handled correctly, the index will fail to be built correctly.